I know. Before you even ask I'm just going to say, yes. Yes, I know you probably did come over here wondering how in the heck a comic book site got tangled up in my RSS feed. Stranger things have happened. For example last night I accidentally set my blog to private and no one could get in for about an hour. There was some freaking out in my in box over that one. Oopsie. Sorry, I was just playing around with a new blog I started, Controlling My Thighs, and I'm not ready to unveil it yet so I accidentally privatized the wrong blog. My bad. There really is a point to this post. Somewhere. And I promise I'll get to it in my usual roundabout way. 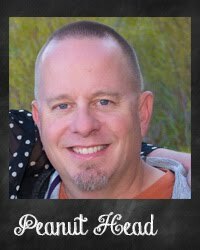 I actually just want to share a little story about Peanut Head educating the troops. Our troops. Since he can't yell at sweaty Grunts anymore, he has to impart his wisdom somewhere. Since we had kids, they naturally became the recipients of his vast wisdom. Not unlike the little orienteering lesson with the girls, this particular lesson made a bit of an impact. Not necessarily a positive impact, but an impact. I'm going to have to sidetrack a little bit before I show you what I'm talking about. I know. That never happens around here. I'm always succinct. Sidetracking . . . we have a little routine for Sundays. Part of our Sunday routine is Family Movie Time. Peanut Head pops popcorn and we settle in and watch a movie together. 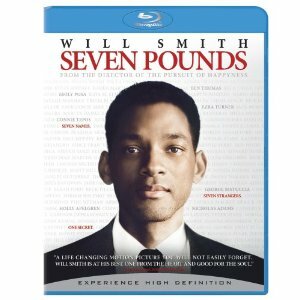 Well, a couple weeks ago I bought the movie "Seven Pounds," with Will Smith. I love Will Smith. He's so sweet. I couldn't wait to watch the movie, I was so looking forward to it. Peanut Head kept asking me what the movie was about, and I kept telling him "I don't know. I've heard from a lot of people that it's really good, but they couldn't tell me what it was about or else it would give it away." I thought we were good with that explanation. I kept telling Peanut Head how excited I was that I was finally going to be able to watch "Seven Pounds." I excitedly got settled in for the movie. All the while, Peanut Head didn't say a word. But then Peanut Head doesn't talk a lot, so this wasn't unusual. I think it's a Grunt thing. The movie started and imagine my surprise when this movie came up on the screen." I felt betrayed. Tricked and betrayed. How could my beloved do this to me? I don't think it was a stretch for him at all. He didn't even laugh. He just acted like it was the plan all along. I kept looking at him, and looking at the movie, and looking at him, and back at the movie. I was confused. I was huffing under my breath and thinking to myself "I should get up. I should get up and stomp off. I have better things to do than watch this drivel." And I'm a little embarrassed to admit it, but I sat there through the whole thing and watched it. Hey, the popcorn was dang good and I was cozy under that blanket. And while I didn't love the movie, it wasn't the worst movie I've ever seen. The girls thought it was most excellent. Especially Stinkerbell. She liked it a little too much. Disturbingly so. But then if you'll remember, she wore this for Halloween last year. I'm trying to focus on the positive here. Against my nature as it is. Perhaps we can use this movie somehow to impart a little educational lesson. Diversity. 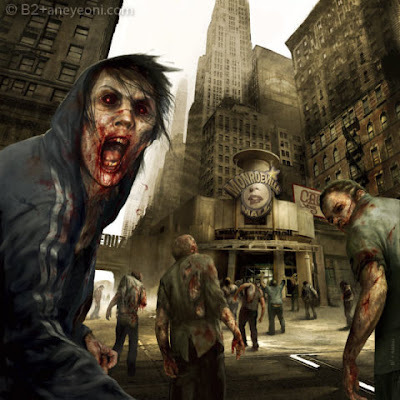 By watching the zombies and respecting the way they choose to live, we are embracing diversity. Yes. Bad Parenting Choice save. Never mind calling CPS. We're good now. 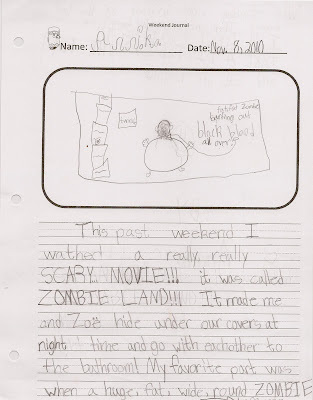 Except that The Stink went to school the next day and wrote about the experience in her weekend journal. This past weekend I wathed (spelling errors are left alone, even though they are causing my left eye to twitch) a really, really SCARY MOVIE!!! it was called ZOMBIE LAND!!! 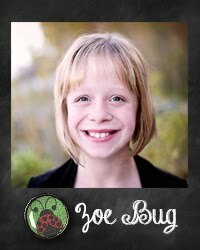 It made me and Zoe hide under our covers at night time and go with each other to the bathroom! My favorite part was when a huge, fat, wide, round ZOMBIE was standing right in front of the last human's. Then one of the last human's said . . . I'M JUST GOING TO TAKE A LITTLE OFF THE TOP! and cut off his head! I know. WE'RE SUCH AWESOME PARENTS!!! I especially love her little smiley face at the end. And her excessive use of punctuation marks. She has her Mama's enthusiasm. Er . . . exaggerating tendencies. The problem with exercising bad judgment with our kids and letting them watch such educationally devoid movies, is that they tell people about it. "Zip, zip, zip it, Sister Girl. Not telling. Not telling the people about the baaaaaaaad movie." And dangity, dang dang. I still haven't gotten my ESP-to-the-kid messaging system up and running. Must make that a priority. 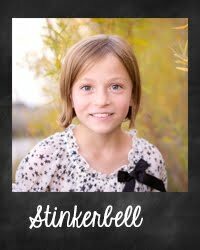 So now Stinkerbell's teacher, her teacher whom I love as much as cupcakes, probably thinks I'm a Cretin now. I almost fell outta my chair when that picture popped up on the screen! GEEZ! Could you have chosen a less scary opener!?!?! Funny story. SO, did you watch 7 pounds yet??? I am laughing so hard right now!! My kids would love that show... oh man, they're always telling everyone everything I DON'T want them to tell anyone....I am still laughing... I think you're awesome... they will have the best memories together. And my husband would totally do that too! Number 1 Rule in Z-land: Enjoy a daily chuckle at Controlling My Chaos' blog. ..Loving It, as always!! 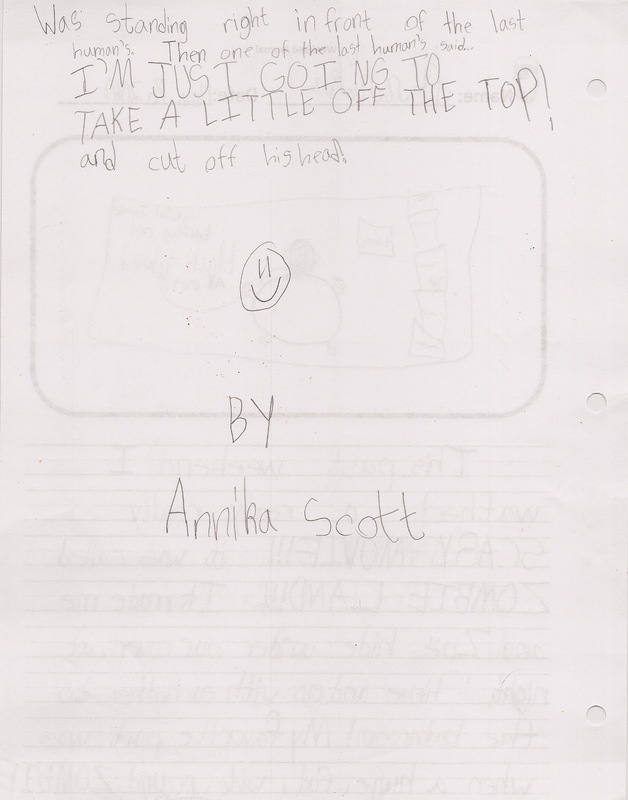 Annika's letter was my fave. "...and cut off his head!" As my frustrated little guy, who's now 17 1/2, said to me back in 3rd grade when confronted about his teachers concern about all his "inspired" drawings and quotes - "FINE! I'll just draw HEARTS AND RAINBOWS!!!" Oh Jill. That is AWESOME! Now, your children will survive! they know the rules! Rule 1! Cardio! Zombie land has other life skills in it... I mean, rule 3 is seatbelts. See, real life skills! Ok, for real, we had Zombieland as the screen saver on the PS3 for a while because Art and I loved that movie, but we had to remove it because the kids were asking too many questions. But seriously. Bill Murray. He had to crack you up! Relax...you're talking to someone who is WAYYYY worse than you. Yup...it's true. I came home one night from a lovely date with my man, to two small children (8 & 9 at the time), watching (or "wathing"...lol...sorry, couldn't resist) FAMILY GUY!!!! OMG...you don't even know the wrath that came upon my stepson's head that night. It's a wonder he's still able to walk...and breathe. Anywho...my 9 year old proceeded to write AND illustrate with pics, what she had seen that night in one of her "writing" assignments. Nothing good can come from a writing assignment and Family Guy...trust me. So don't feel bad...:) You got company. 7 Pounds is a much better movie! How do we get in on "controlling my thighs?" Never heard of the movie, but aren't you a good wife for sticking around! I hate watching movies-not sure why, but I am not fond of just sitting here (even though I will sit at my computer no problemo!). 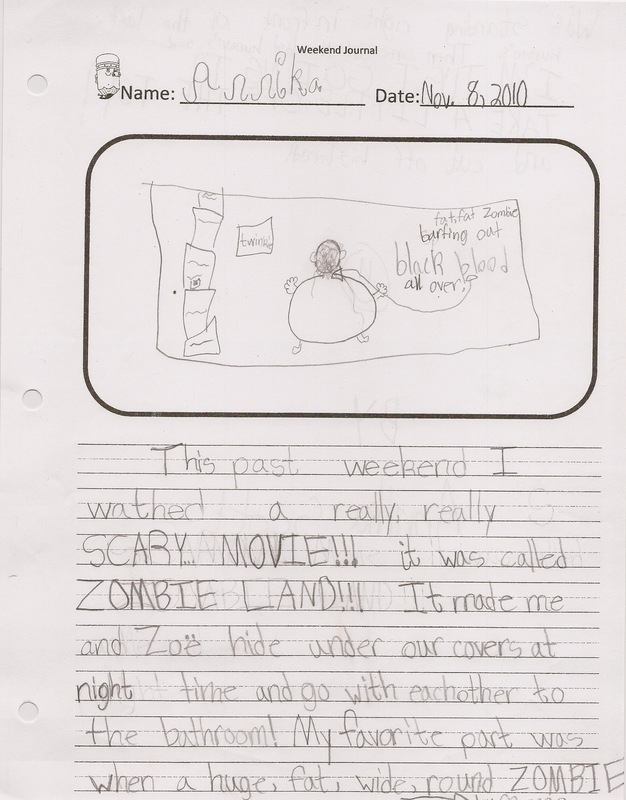 My kid would totally rat me out in her school journal too. If teachers wouldn't MAKE the kids do journal time, your secret would have been kept safe. Ha ha, just kidding, I love reading what my kids say we do all weekend. 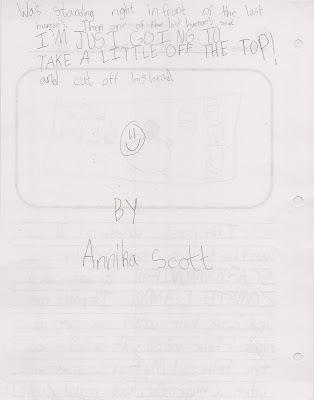 I had a first grader write in his journal that when he grew up, he wanted to visit a "BAR". I laughed at the kid's answer! The zombie movie had the teacher in stiches--I am sure of it! I'm simply incapable of selecting appropriate movies. I popped "The Big Lebowski" in to keep my 12 year old son and his younger friend busy while I worked on doing our business tax. OOPS! I returned to the room at the point where a man and a woman are moving rhythmically in a more or less horizontal position. My son said "Too late to stop it! : and unfortunately he was right. So for an encore we watched "Pulp Fiction". Fortunately both boys turned out better than okay, but they don't let me pick movies anymore. 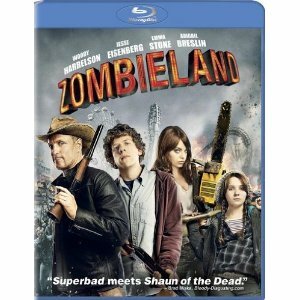 I loved Zombieland! My husband & I went to see it for our anniversary last year, 2009, and since that day I've referred to him as Muskego, which is the city is grew up in. LOVE IT! We haven't let our 9 yr old watch it yet, but she's completely addicted to Plants vs. Zombies on my ipad. i had to laugh, and i understand your shame, but really, i think i would just be glad my child was WRITING in the journal!! 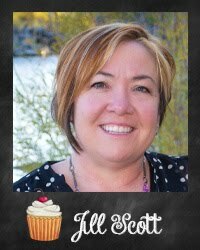 my kids hate to write! Hilarious! I've already noticed that at 2 1/2 my oldest is starting to rat me out. I gotta watch myself!